A snood in the traditional human sense is a cross between a hood and a scarf worn on the head by women, often to hold their hair in place. Not surprisingly, someone came along and decided this sort of attire could be highly desirable for dogs as well! It’s not just about fashion though. When it comes to dog snoods – they have a practical purpose as well! Some people buy a snood for dogs who have long hair, long ears or both. Why? The goal is to help keep said long bits out of the food bowl. Now this might sound a little over the top to those of us who don’t pamper and prime our dogs for beauty pagents – but for those who do show their dogs (or dog parents who just love cleanliness). Besides at the dinner bowl, a snood if often used to prevent bits of grass and vegetation getting caught on fur and ears when sniffing through long grass when out and about. They can also simple be use for warmth, particularly as they are often made of knitted material. These are the practical reasons why people use dog snoods. Practically speaking there’s little difference in the products sold that we could consider to be snoods – some are called hats, some are hoodies, some are beanies. 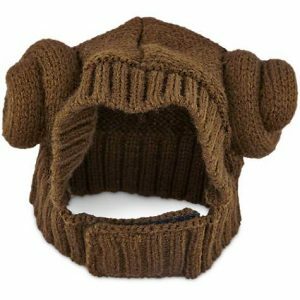 This Star Wars knit dog hat (link goes to Petco) for example is snood-like in its style.